Five Superintendents at an annual salary of £115. Five first-class Inspectors at an annual salary of £85. Five second class Inspectors at an annual salary of £75. Thirty first-class constables at 20/- per week. 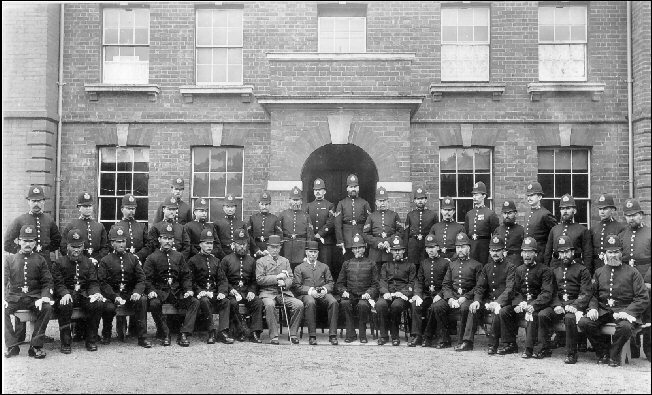 Twenty third-class constables at 17/- per week. The county was split into 5 Divisions with a Superintendent in charge of each. Aylesbury, (which was to be the Headquarters of the Force) Fenny Stratford, Steeple Claydon, High Wycombe and Slough. The Chief Constable was paid an annual rate of £300 plus £100 as a reasonable allowance for extraordinary expenses, purchase and keep of horses. Five horses and carts were provided for use by the principal officers, in addition with the work as Inspectors for weights and measures. The Chief Constable travelled around the county in a pony and trap accompanied by his groom. Old lock-ups were converted into police stations until purpose built stations could be built. The Chief Constable was given a house near the present Judge's lodgings at Aylesbury. Constables were found lodgings and found themselves sharing up to four a room. A search was made for suitable sites for the new police stations, and a housing policy was formed. When the first constables were posted to their respective beats it was his responsibility to find his own lodgings, which would then become the police house. Outside the constable would have to place a metal plate marked "County Police" with which he was issued at the time of his posting. The Chief Constable considered this metal plate very important and it was considered to be part of the constable's appointments. These metal plates could be seen outside "Beat Houses" up until the late 1980s. Chief Constables Office, Aylesbury, 21st March 1857. The Force will parade on Sunday morning at 10 o'clock and such men as are already in possession of waist belts will appear in them. As the men are yet but incompletely clothed they will not be marched to church, but every member of the Force is distinctly reminded that he is expected to appear at the parish church and to sit in that part of it which the minister has appointed for the use of the Constabulary. The Superintendents will be in attendance to point out the sittings and it is expected that every man will be in possession of a prayer book. The Chief Constable directs that everyone will be seated a quarter of an hour before the service commences and that the utmost order and decorum will be observed. On the service being concluded the men will continue seated until the congregation have left the church when Superintendent Bragg will give the signal to rise and quit the church; and this must be done in the most orderly and quiet manner; the men on no account to passing over the grave stones or quitting the church yard with unbecoming haste. The more quiet and orderly the police on all occasions are, the more they will be respected as a body, and the Chief Constable trusts that every member of the Force will do his utmost to gain for himself the respect of all classes. Signed W.H. Carter, Chief Constable. Some of this practice continued until 1934. Every constable even had to buy his own prayer book. This general order was one of many issued over the years. In particular a large number were issued during the early years. The first Chief Constable was a very strict disciplinarian and senior officers reported constables for the most trivial of matters. Many constables were fined out of their pay; others were dismissed. The first constable was dismissed from the Force for being drunk at his lodgings. Even though members of the public did not see him and he was in the privacy of his own home, he still met with the ultimate - dismissal. Over the years and after successive Chief Constables, discipline became less rigid. A Constable's shifts consisted of six hours during the night and three hours during the day. During this period he would have to meet his superior officers at conference points at pre-arranged times. A conference point would be held at a local landmark - for instance, outside a well-known house or a road junction. The constable would be given information and updated on matters of crime, observations, etc. The superior officer sometimes did not turn up but the constable would have to be there. He would also have to note the fact he was there in his journal. In the very early days if the constable was found to be only a minute late he would be fined 2/6d out of his pay. During his off-duty time he was not allowed to leave the location of his lodgings in case a member of the public required the constable. During the Buckinghamshire Constabulary's one hundred and eleven years' existence hundreds of men and later women from a variety of backgrounds served in the Force. On the 1st April 1968 the Buckinghamshire Constabulary amalgamated with the Oxford City Police, Oxfordshire Constabulary, Berkshire Constabulary and Reading Borough Police forming the Thames Valley Constabulary now called The Thames Valley Police. The history of the Bucks Constabulary, its officers and men is being recorded by Mick Shaw, a serving officer with the Thames Valley Police. He has collected over 2,500 photographs and has records of around 2,500 Bucks officers. In 1856 the Government passed an Act making it compulsory to establish a paid police force in the country. On the 6th February 1857 the Buckinghamshire Constabulary was established. Thirty-two candidates applied for the post of Chief Constable and at the Epiphany Sessions held on the 6th February, Captain Willoughby Harcourt Carter was appointed as the first Chief Constable of this Force. The Force was to see another four Chief Constables before it amalgamated with Oxford City Police, Oxfordshire Constabulary, Berkshire Constabulary and the Reading Borough Police on the 1st April 1968 forming the Thames Valley Constabulary later re-named the Thames Valley Police.